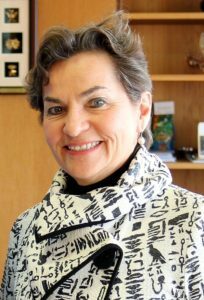 Christiana Figueres (b.1956) is a Costa Rican diplomat and international leader on climate change, and daughter of a former Costa Rican president. She was Executive Director of the UN Framework Convention on Climate Change (2010-2016), and is currently the governor of Mission 2020, an initiative to bend the curve on world greenhouse gas emissions by 2020. In 1995, she founded and directed for eight years the Center for Sustainable Development in the Americas, to support sustainability in Latin America and the Caribbean. She is also Vice Chair of the Global Covenant of Mayors, a World Bank Climate Leader, Distinguished Fellow for Conservation International, and Board Member for Climate Works and the World Resources Institute. Figueres has received many awards such as the Great Cross of the Order of Merit in Germany (1985), Legion of Honor of France (2015), National Guayacan Medal of Costa Rica (2016), top 100 Time magazine influential leaders of the world (2016), Joan Bavaria Award from CERES (2016), and one of the five most powerful women in science (BBC Mundo, 2017). See The New Yorker profile of Figueres by Elizabeth Kolbert (“The Weight of the World,” August 24, 2015, pp24-30).